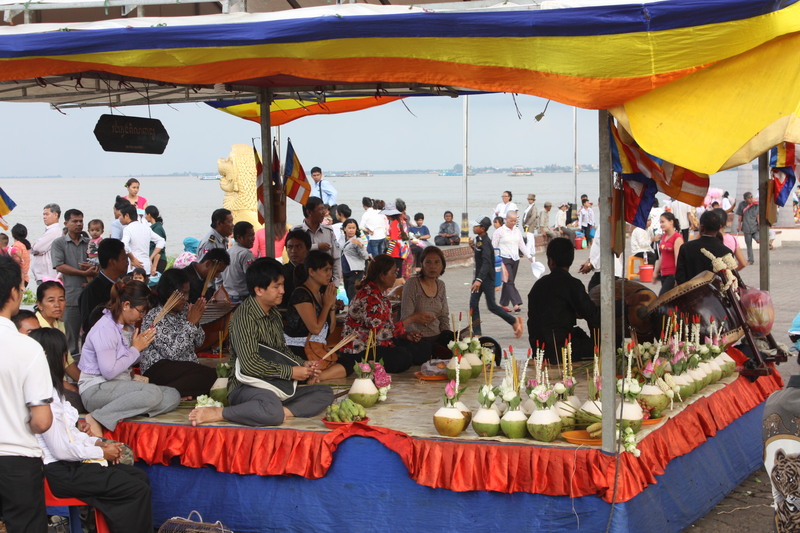 A ceremony in Phnom Penh | Where to next? Something special was going on the day we arrived in Phnom Penh, Cambodia. Lots of people were gathered in and around a colourful stand near the river. In addition to the crowds, there were speeches, flags, banners, flowers, incense, prayers, coconuts, offerings and plenty of music. It didn’t appear to be a particularly happy or a sad occasion—just solemn and respectful. At the time I didn’t know it was special, but the next day all signs of the event were gone. I’m guessing it was a local Buddhist ceremony because I can’t find anything on the net that links to the relevant date. But the day was just getting going. After leaving the ‘ceremonial’ stand, we walked quite far down the corniche (if that’s what they call their riverside walkway) and came upon an unexpected traffic jam—an elephant being walked home from his day’s work—and an important toilet, funded by the World Toilet Association, Republic of South Korea. Who knew there was an international toilet organisation. Anyway, the toilet is downstairs from the local tourist information centre. It started to rain about the time we arrived at the tourist centre, so we ordered some lunch (delicious, but no photo) and I whipped out the laptop and checked email on their free WiFi. Before we resumed our foot tour of Phnom Penh, Poor John and I had ceremonial pees in ‘Mr Toilet Public’ and probably pilfered a generous supply of toilet paper, if there was any (can’t remember now). A few days later, we stopped in for another pee. Not because the toilet was that great, but because we were already in the neighbourhood. As an aside, the tourist info centre and its accompanying Mr Toilet Public are quite a long way from the centre of town. Bad planning. And as another aside, Poor John and I are really glad we set out to explore this city from the minute we arrived. Good planning. Also don’t forget to pick a number before 29 February 2012. That’s why I throw them in.